Photo Stream is Apple’s cloud-based photo sharing service that allows easy sharing of photos between devices regardless of their operating system. The photos can be viewed on the iPad, iPhone, iPod Touch an Apple TV as well as on Macs and Windows-based PCs. The feature was added to iOS 5 received some new features in iOS 6 and a few minor tweaks in iOS 7. You can turn on Photo Stream for any of these supported devices, and your latest photos will automatically be shared between any devices on your Apple account that have Photo Stream turned on. 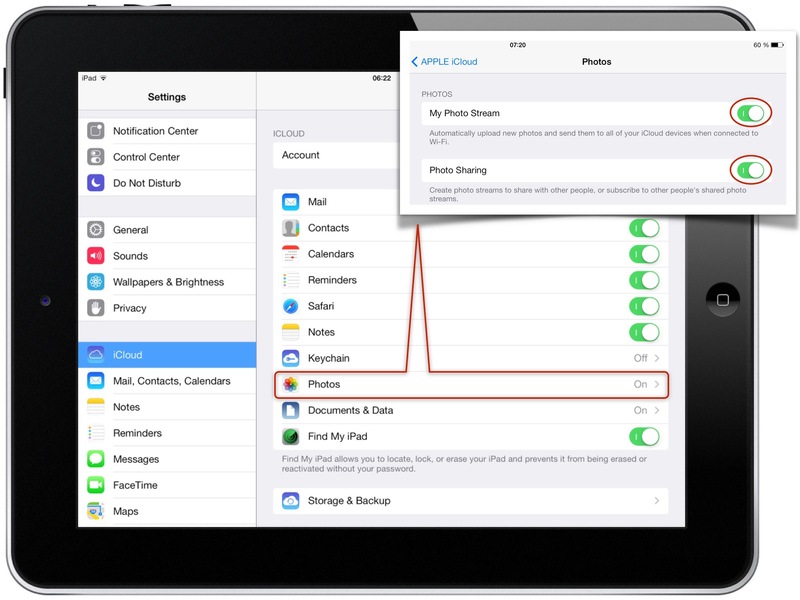 This means you don’t have to actively download photos on your iPad that you took with your iPhone, if both devices have Photo Stream turned on, the photos will be privately shared automatically. Apple’s Shared Photo Stream was introduced in iOS 6.0. While the default Photo Stream works for any device on the same Apple ID, Shared Photo Streams allows you to share a specific set of photos. You create a Shared Stream, give it a name, collect photos you want to share and then post it as a Shared Stream to family, friends or colleagues. 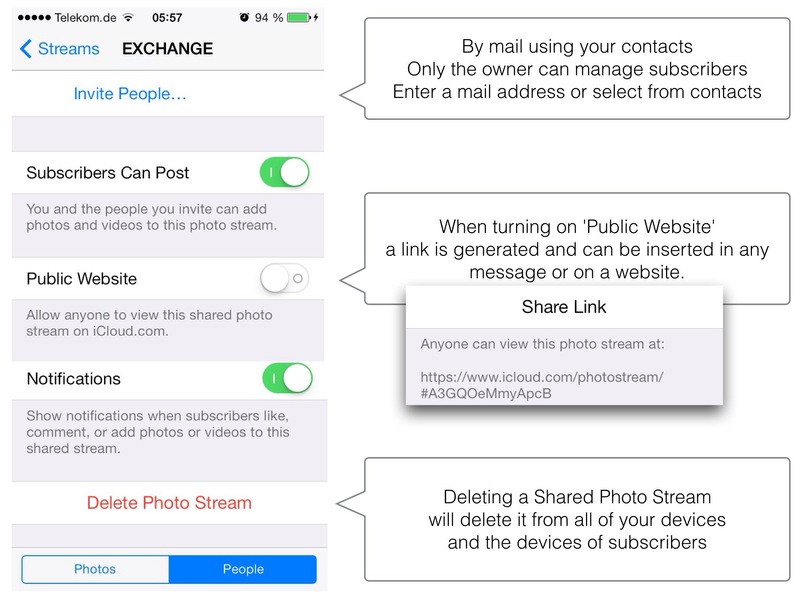 You can even have multiple Shared Photo Streams with different recipients. Photos taken with the device are not automatically shared. So there is no worry that the photo you take will automatically goes out to everyone. In order to share a photo with your Shared Photo Stream, you have to select the photo in the Photos app and specifically share it. You can also access Shared Photo Streams between your own devices, including Apple TV. And while the name implies ‘Shared’, you don’t have to share the photo stream with any of your friends. You can use it as a private stream between your devices. On iOS devices (iPhone, iPad, iPod touch) every photo you take (screen shots too) will be added to your Photo Stream and automatically uploaded to iCloud. Photos will only upload when the device is connected to Wi-Fi and only the photos taken after Photo Stream is turned on will upload to iCloud. Once those photos are uploaded they are viewable in My Photo Stream album on your iOS device. ‘My Photo Stream’ album is located inside the Photos app, under albums, on devices that are connected through iCloud. This only works if Photo Stream is enabled on each device and all devices use the same iCloud account, that means the same Apple ID. Once you have each device logged into the same iCloud account you can setup Photo Stream. If you want to use Photo Stream it’s worth knowing what it’s not. It is not an online photo container (like Google Drive) that just syncs photos between all of your devices. This might be the source of misunderstanding and complaints of iOS users. Photo Stream is a constant flow of images (a stream) that acts as a conduit to route photos to your other devices. It’s like water. At anytime you can grab a bucket, dip it in, fill it up and haul it to a different location (the camera roll, a friend, etc). Otherwise you have no control over the water; just how much you take and where you forward or save it. If you take a photo with an iPhone without connection to a WLAN (which is almost often the case when making a walk) the photo is saved in the Camera Roll of your device. Coming home, your device connects to your WLAN and the upload of photos to Photo Stream starts. Now you can view them e.g. on an iPad. Photo Stream is totally automatic, but if you have a Mac, you can choose to turn off automatic uploading when you set up Photo Stream in iPhoto or Aperture. This can be useful if you regularly import very large numbers of photos. iCloud stores your new photos for 30 days so your devices have plenty of time to connect and download the photos. Your iOS devices keep a rolling collection of your last 1000 photos, and you can save your favorite shots to your Camera Roll or any other album to keep them on your device permanently. Because your computers have more storage, they can keep all your Photo Stream photos. If you deleted photos in your Photo Stream they will be deleted on all of your devices which is a consequence of the automatic syncing feature. 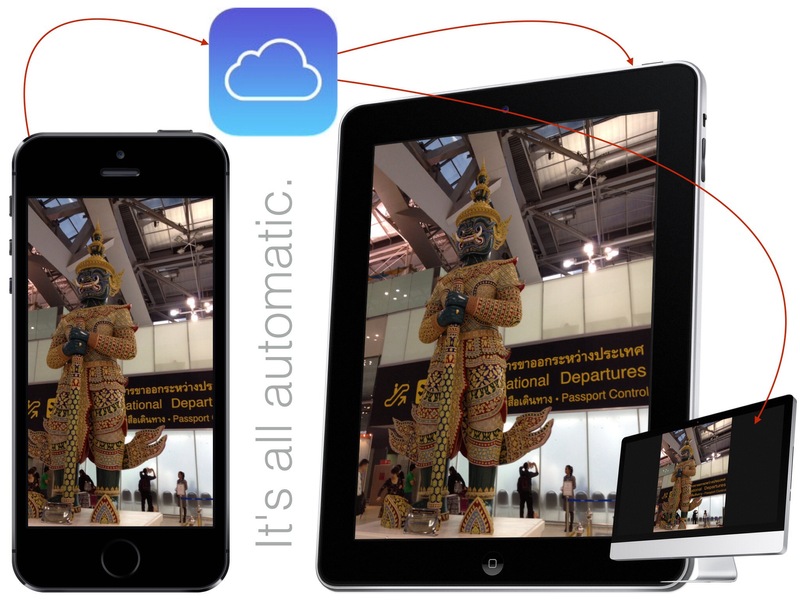 Open the cloud provider’s client application, choose photos from Camera Roll and upload them to the cloud storage. On your other device then download them to its Camera Roll. like PhotoSync (by touchbyte) instaShare (by Lukas Foldyna) or Safety P+V (by 83 Technology) which allows direct transfer between two devices using a common WLAN or a Bluetooth connection. which lets you quickly and easily share photos, videos, contacts — and anything else from any app with a Share button. Just tap Share, then select the person you want to share with. AirDrop does the rest using Wi-Fi and Bluetooth. No setup required. Unfortunately AirDrop is not available for previously supplied iPhone 4S, 4, etc. and iPad 3rd Generation, iPad 2, etc. So there still will be a need for other ways. But there is also a simple solution which lets you transfer photos without using a cloud storage, an app, or Airdrop even if the devices you want to transfer to are not in the same WiFi network and cannot be connected via Bluetooth. What you need is a connection to the internet (cellular or WiFi). It’s a kind of transfer to remote devices with the help of Shared Photo Stream. In the example I called this stream (photo) EXCHANGE. The new stream is immediately created on all of your devices even if the device is not connected to a WiFi network but to a cell net. Even if there is no internet connection yhe stream is created but only on your device and it’s created on all other devices if your device reconnects to the internet. Try it out by creating a stream in Airplane Mode. 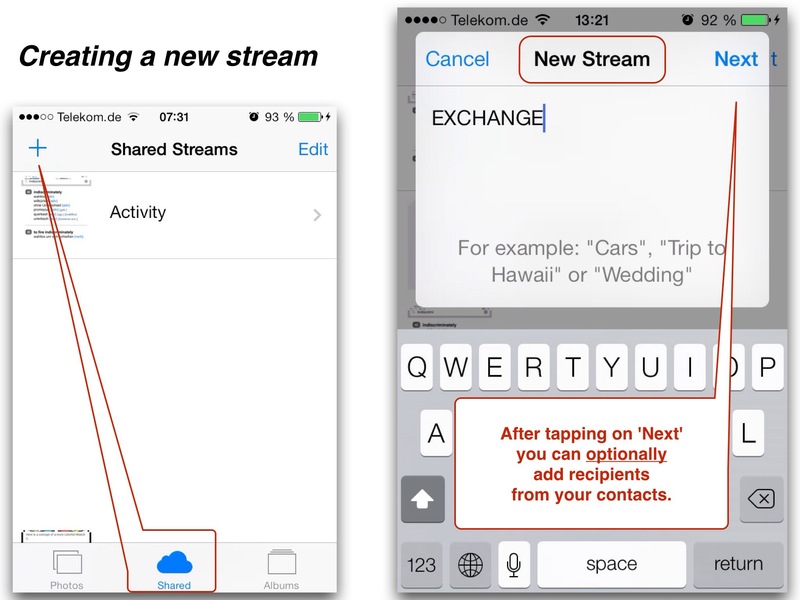 If you didn’t enter any recipients of this new stream you will see the subtitle ‘Shared by you’ which indicates that shared photos are only available on devices using your Apple ID. 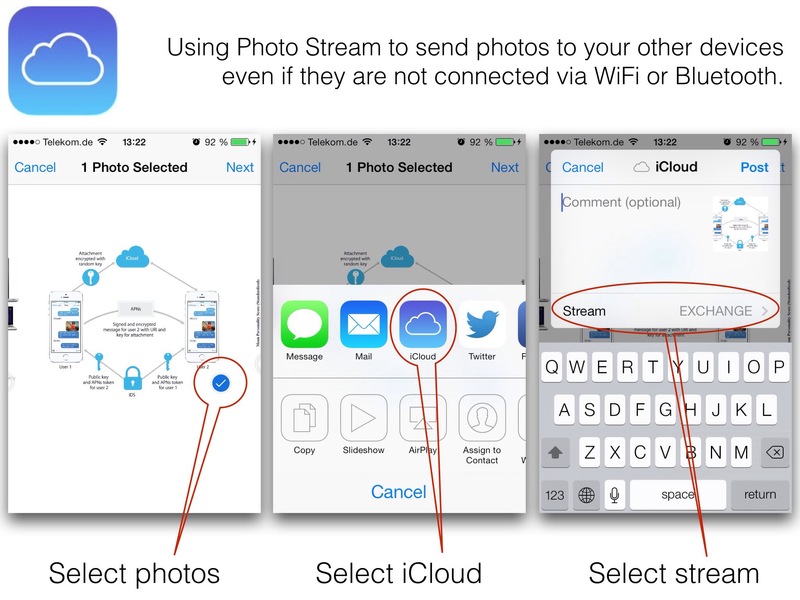 If you now want to stream photos, select them, tap on iCloud, and select the stream you want to assign them to. Tap on Done. Depending on the transmission rate of your cellular connection it takes just some seconds and the photo is already available on your other devices which might be thousands of miles away. A family member (or all optionally entered recipients) can view the shared photos. If you delete selected photos or Shared Photo Streams they are immediately deleted from all your devices and people you shared photos with cannot access them any longer. That’s what you should keep in mind when removing photos from the Photo Stream. If you didn’t save them in the camera roll or any other local storage you will lose them forever. iCloud limits the number of photos that can be uploaded to My Photo Stream or shared photo streams within a given hour, day, or month to prevent unintended or excessive use. Learn more in My Photo Stream and iCloud Photo Sharing. If you exceed one of these limits, your uploads to My Photo Stream will be paused temporarily and you may see a notification message on your device. Your uploads will resume automatically after you no longer exceed one of the limits, such as in the following hour or on the following day. These sharing limits are separate from the upload limits above. For example, in the same day you could upload 10,000 photos to My Photo Stream and then share those 10,000 photos or 10,000 other photos. Photos uploaded to My Photo Stream or shared photo streams are not counted against your iCloud Storage. The photos that you upload to My Photo Stream are stored in iCloud for 30 days to give your devices plenty of time to connect to iCloud and download them. Find out how to save photos from My Photo Stream or a shared photo stream to your Camera Roll or computer. The following image file types are supported for Photo Stream: JPEG, TIFF, PNG, and RAW. The following video file types and file formats are supported for iCloud Photo Sharing: MP4 and QuickTime file types, and H.264 and MPEG-4 Video file formats. Videos can be up to 5 minutes in length. When importing photos to an iPad using the Camera Connection Kit, photos are saved directly to Camera Roll. If Photo Stream is enabled and you are connected to a wireless network, you could potentially reach any of the limits listed above. To avoid this, disable Photo Stream when importing photos to iPad when using the Camera Connection Kit. When importing large numbers of photos to either iPhoto or Aperture, you could potentially reach any of the limits listed above if you have selected Automatic Upload in the Photo Stream preferences. Both iPhoto and Aperture will pause uploading to Photo Stream when the maximum has been reached. Uploading will automatically restart at the next hour, day, or month, depending on which limit was reached. On a Mac or PC, your photos are downloaded and stored in full resolution. On iPhone, iPad, iPod touch, and Apple TV, your Photo Stream photos are delivered in a device-optimized resolution that speeds downloads and saves storage space. Dimensions will vary, but an optimized version of a photo taken by a standard point-and-shoot camera will have a 2048 x 1536 pixel resolution when pushed to your devices. Panoramic photos can be up to 5400 pixels wide. If you sign out of iCloud or turn off My Photo Stream on an iOS device, all the images in My Photo Stream are removed from that device. The images in My Photo Stream on your other devices are not affected. Images added to My Photo Stream are saved on the iCloud server for 30 days from the date you added them to My Photo Stream. If you sign in to iCloud with the same Apple ID and turn on My Photo Stream on another device, those photos will automatically download to this device. Before turning off My Photo Stream, it’s a good idea to save any photos that you’d like to keep to your Camera Roll. To do so go to My Photo Stream, tap on Select, tap on the photos you want to save, tap on the sharing control (bottom left), and tap on Save to Camera Roll. Shared photo stream content is not automatically backed up. Photos and videos must be saved locally before backing up your device. Any comments or Likes attached to a shared stream photo or video are not be saved with the photos or video. No normal user will exceed these limits. The good news is that photos uploaded to My Photo Stream or shared photo streams are not counted against your iCloud Storage. But what you should know is that your iCloud backups include images saved in your camera roll. So don’t forget to organize the storage by periodically transferring photos from the camera roll to an appropriate storage e.g. your computer or to other cloud storages like Box, Dropbox, iDriveSync, OneDrive, or Google Drive. With ‘Public website’ you get a link for sharing an album on social networks. Using Shared Photo Stream is a simple way to transfer photos by just using Apple’s built-in apps. It just works.